I've been talking about going to the Picnik for many years, but last Sunday I walked the walk: I attended August 14th 2011's edition of the Piknic, which feature artists primarily from the UK: Dorobo (Canada), Appleblim, Addison Groove, and Hotflush head-honcho Scuba aka SCB. The journey on bike was long and perilous; after being slowed down by the Gay Pride parade and put off track by the distant bass hits coming from the neighbouring "Fete des enfants", I arrived at the Ste Helene Island for the show. 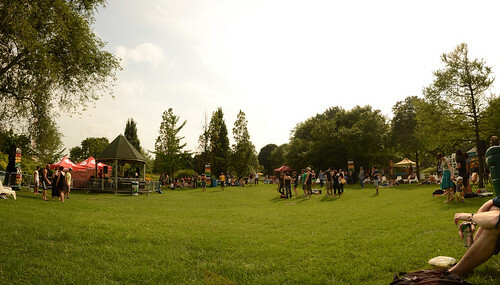 The site is surprisingly intimate: while the area reserved for the Picnik can probably hold 1000+ people the area nearest to the stage, which forms a pit and is bordered with lawn furniture, is probably smaller than some of the bigger indoor venues. First off was Dorobo: a local electro-fiend who I had never had heard about. I arrived late because of all my misadventures, but the last 15 minutes of his set was mostly deep house. Second off was Appleblim, hailing from Bristol. 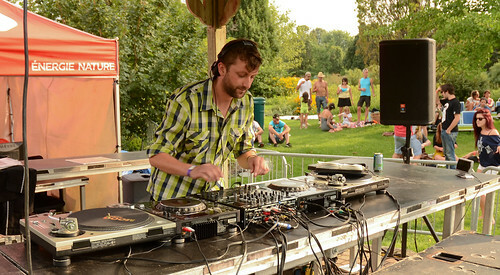 Previously co-owner of Skull Disco and currently running Applepips, this guy was also a regular DJ at the legendary FWD>>. I was expecting nothing less than all-out dubstep from him, but I felt that the harsh transition between the previous set and an attempt at spinning some 2-step material made the set much more dance-y. Mixing was flawless and massive tunes were dropped. At the one hour mark, the area in front of the stage was filling up, and the crowd was very much into it. Third up, Addison Groove. Originally scheduled for later that Night, AG took Scuba's spot for an undisclosed reason. He rocked the ones and two with his distinctive style, however I felt that he too watered down his set a bit for his Quebecois audience. I request his remix of Jimmy Mack for the end of the set, but sadly I didn't get it. Montreal isn't nearly "rave-y" enough, according to him... What I did get thought is info about upcoming releases on Tectonic as AG, and Blackbox as Headhunter. Props to AG to have talked and shaken hands with his fans... Try doing that with YOUR favourite artist! 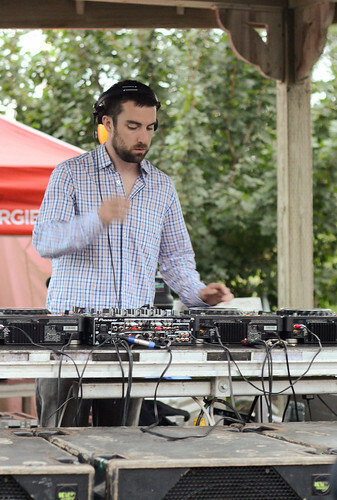 Last but not least, Scuba hit the decks. Or rather SCB in this case, as his set too was more on the dance side of things. Awesome none the less though... By the time the sun had set, the place was completely crowded and people were straight up juking out. I unfortunately had to leave before the end of his set, which probably lasted past 9PM as was planned. 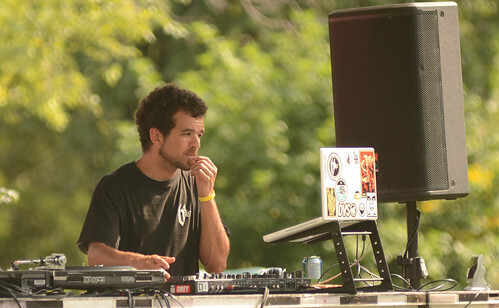 Big tunes were dropped, including Scuba's own "Feel It". There was only one disappointment: the fact that damn near nobody even knew who were the artists and what they were playing. At some point, Joy Orbison's "Source Delight" ("Ellipsis"?) was cued in, and I was the only one howling with my gun-fingers in the air at the MASSIVE, unreleased tune. I was ashamed of being part of such an uninitiated and non-reactive crowd. To add insult to injury, I heard one of the Piknicers commenting on how he had "heard better dubstep" during AG's set... Yeah, whatever. Overall though, the event was awesome. Fresh air, sunshine, cold beer and an excellent line-up of artists you definitely don't get to hear live very often... everything was set for success. 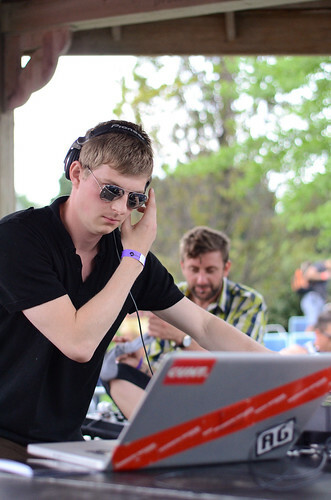 Thanks to the Piknic for putting Sundays back on the map!